by Edited By Ghez 2011 published by Xlibris, Corp.
"The Walt's People series, edited by Didier Ghez, is a collection of some of the best interviews ever conducted with Disney artists. 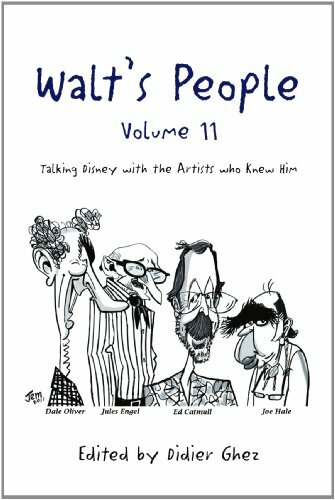 Walt's People - Volume 11 features in-depth interviews with Ray Aragon, Frank Armitage, Brad Bird, Carl Bongirno, Roger Broggie, George Bruns, Ed Catmull, Don R. Christensen, Andreas Deja, Jules Engel, Joe Hale, John Hench, Mark Henn, John Hubley, Glen Keane, Ted Kierscey, Ward Kimball, I. Klein, Mike Lah, Eric Larson, Ed Love, Daniel MacManus, Tom Nabbe, Carl Nater, Dale Oliver, Walt Pfeiffer, Jacques Rupp, David Snyder, Iwao Takamoto, Shirley Temple, Frank Thomas, Ruthie Tompson, and Richard Williams. It contains hundreds of new stories about the Studio and its artists and should delight even the most serious historians and enthusiasts.